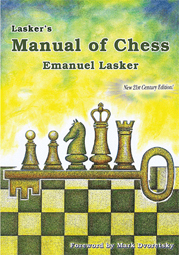 None other than Mark Dvoretsky writes in the foreword to Lasker’s Manual of Chess that though the book was first published eighty years ago, it “has not lost its relevance even now,” and that he still follows Lasker’s training advice to this day. He notes that many important themes were first developed by Lasker, such as the “desperado” and ways to defend, and that he derived “great pleasure and great benefit” from the sections devoted to combinations, positional play, and chess aesthetics. Dvoretsky finds that this book “helps you examine different kinds of problems in the most varied positions and it is exceptionally important, both for practical players and for trainers.” If the greatest trainer on the planet thinks so highly of this title, then it deserves your attention.